You do most of your work in apps, but you manage your files in the Finder. 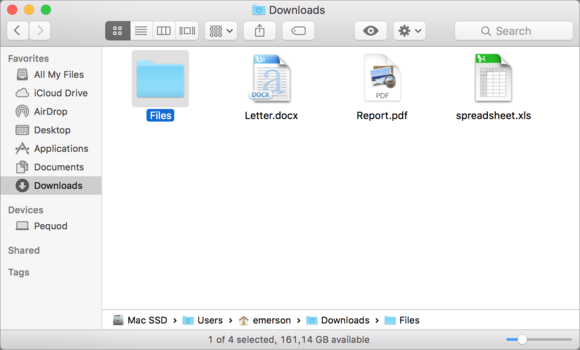 This window and file manager is the heart of OS X, and offers a plethora of features for working with files: sorting, tagging, copying, moving, etc. There are also a number of ways to work with windows in the Finder, using multiple windows, or just using tabs in a single window. Here are six ways you can super-charge your Finder windows. 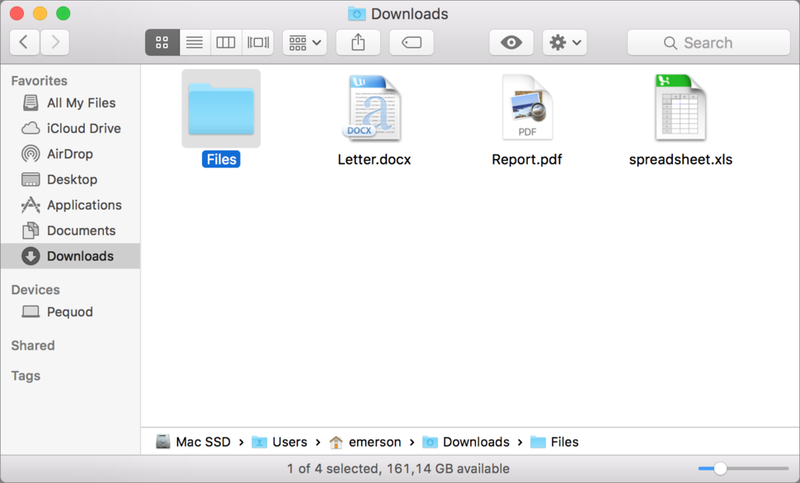 When you’re in the Finder, you are looking at files and folders, are two view options that can help you work more efficiently by showing you more information about your stuff. In the View menu, choose Show Status Bar and Show Path Bar. As you can see below, the Status Bar is at the bottom of the window, and shows the number of items in the window, how many are selected, and how much free space remains on your disk. And the slider at the right of the Status Bar lets you change the size of icons in your window. The Path Bar, just above the Status Bar, shows the file path of the selected item. This not only shows you where the item is on your Mac’s drive, but also lets you drag a file or folder to one of the folders you see in the Path Bar. The Path Bar and Status bar displaying below a Finder window. To create a new Finder window, just press Command-N. You’ll want to use multiple windows when you’re moving files around from one folder to another, or to an external hard drive or network volume. But if you have a small display, multiple windows can be hard to navigate. For this reason, you can also create multiple tabs in a single Finder window. To create a new tab, press Command-T. The same Finder window, now with two tabs. You can move to another tab by clicking it, or you can press Command-Shift-Right Arrow or Command-Shift-Left Arrow to cycle through your open tabs. Why use tabs? If you need to move some files, find the files you want, then open a new tab. In the second tab, find the location where you want to move or copy them. Go back to the first tab, and then drag the files to the second tab. It’s a lot easier than switching between multiple windows. Tabs also let you keep a number of windows just a click away. 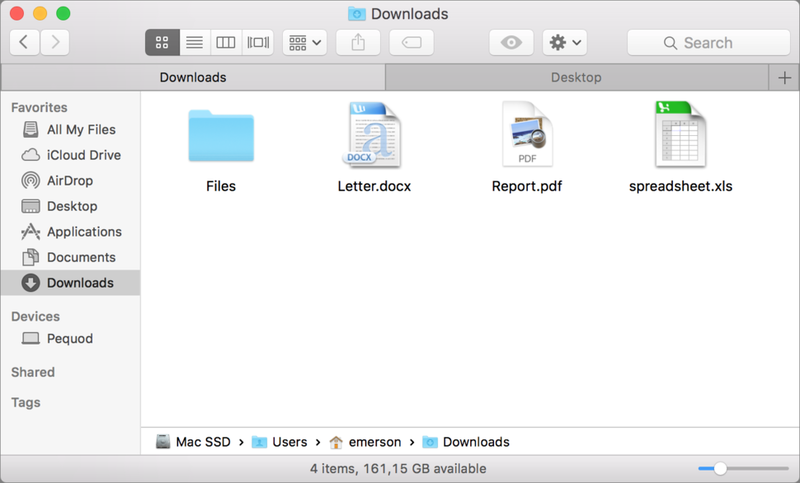 For example, you may want to keep your Documents folder visible, but also want access to your Downloads and Desktop folders as you work. Make tabs for all three, and they’ll each be a click away without cluttering your workspace. If you have multiple tabs in a Finder window, you can drag them to change their order. Just click a tab and drag it to the location in the tab bar where you want it to live. But it gets better. 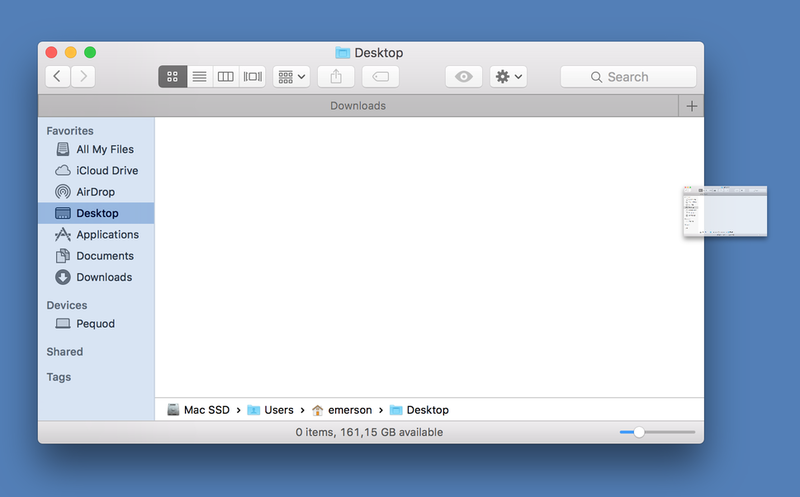 You can also drag a tab from a Finder window to create a new window. Try it; make a new tab, then drag it away from the window. You’ll see the Finder make a new window with that tab’s item—folder or disk—selected. If you drag a tab from a Finder window, it spawns its own window. Try it! What if you want to merge multiple windows, and turn them all into tabs in a single window? Choose Window > Merge All Windows, and the Finder gathers all your windows into one, with tabs. In El Capitan, you can resize Finder windows by dragging from any side or corner. Just click and drag a window to make it larger or smaller. You can even make your Finder window fill the screen by clicking the green button at the top left of the window. I find this a bit too much, but some people, when working with a lot of files, may find full-screen view useful. To exit full-screen view, move your cursor to the top of your display and click the green button again. You can minimize a window, sending it to the Dock by clicking the yellow button at the top left, or pressing Command-M. When you do this, you see a thumbnail of the window at the right of the Dock; just click it to bring it back into view. This is useful if you need to access a number of windows, but not all at the same time. For some reason, Apple has never allowed you to set a preferred window size in the Finder. You may open a new window, resize it, then close it, and find that the next new window you create is a different size. Getting the Finder to remember the size you want is tricky, but Macworld’s Glenn Fleishman offers a solution. Take some time to learn the many options for working with Finder windows, and you may find that your work with files and folders is a lot more productive.